The context of the appellation includes such ideas as – “Symbol of birth”, “Symbol of life”, “Symbol of the beginning of beginnings”. Bronze Age. Second half of II millenium B.C. 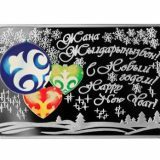 On the obverse of the coin against a background of the national ornament elements, the figure “500” is shown. 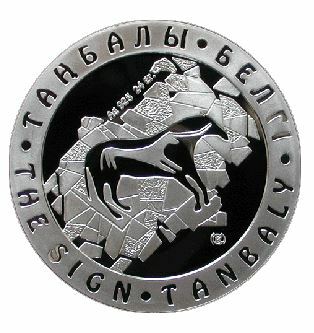 Under it there is the inscription “TENGE”, indicating the face value of the coin. On the upper side of the coin is a heraldic representation of a spiral. 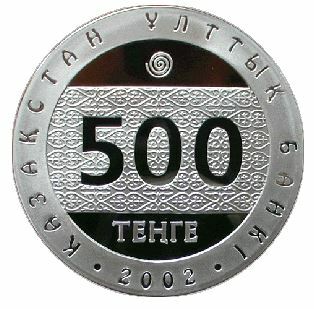 Circling the coin is a wide salient edging, on which the legend of issuing bank in the Kazakh language and the figure “2000”, indicating the year of coinage, are located. Legends are pressed in the edging. At the back side of the coin against a background of conventionalized gravestone the representation of “Belgi” dated to the second half of II millenium B.C. 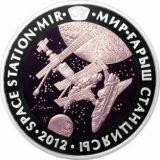 At the left sector of the coin, the legend “Ag 925 24 gr.” indicates the metal of the coin, its standard and weight. 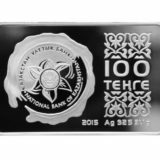 On the right side is a trademark of the Kazakhstan Mint. 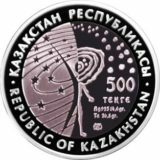 Circling the coin is a wide salient edging, on which the legends “THE SIGN TANBALY” in Kazakh and English, are located. Legends are pressed in the edging.